Fantastic Fantasy and Fantastic German! I am about 20% of the way through the audio book and I think it’s fantastic. The story is, in my opinion, truly captivating and I’m excited to hear more. Furthermore, Lidia Buofino's voice is very pleasant and her acting skills superb (5+ stars!). These positive qualities should sweeten the deal for anyone grappling with German. In addition, the German translation is of very high quality. This is an authentic text and I would therefore recommend it for intermediate to advanced learners. As a learner of German myself from the United States and as an educator with an advanced university degree in TESoL, I can affirm that the pedagogical concept of this language tool is sound. The combination of the e-book with the audio files is perfect for those with verbal, aural and visual learning styles. Even those with more kinesthetic tendencies can benefit from the suggestion laid out in the section “Audiobook Companion” of speaking along with the text. In addition, the recommendations provided at the beginning of the audiobook to listen to the story again and again and take note of improving comprehension are helpful and motivating. 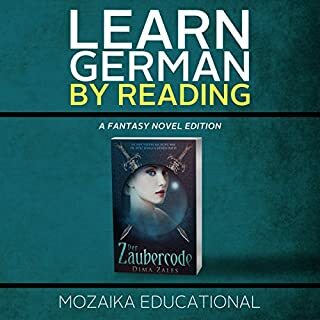 Overall, the marvelous story, the professional narration and the well founded educational advice make this a worthy investment for anyone who would like to expand their understanding of the modern German language.